Trevecca’s urban campus is known for its trees, and the University is taking steps to extend that love for trees past the campus borders. Trevecca’s Urban Farm recently received a $50,000 grant from Nashville Metro Public Health Department’s Community Partnership Fund. The grant will be used to create TreeCycle, a program in which area youth will bike throughout the Napier and Sudekum neighborhoods and plant trees. The grant will provide funding for one year, but Adkins and Janice Lovell, director of grants and foundation relations, hope to find ways to extend the work past that deadline. The grant will allow the urban farm to employ youth for 1,500 hours and create 20 new gardens in the community. Evan Davis, one of Trevecca’s four AmeriCorps VISTA members, will help to spearhead Trevecca’s TreeCycle effort. She’s excited to see the project take shape and looking forward to the impact it will have on the community. Davis and the Trevecca Urban Farm will work with local organizations such as Oasis Bike, Harvest Hands and the Napier Community Center to find middle and high school students to participate in the program. As a kick-off event and a way to increase awareness about TreeCycle, the group participated in Nashville’s Labor Day parade on Sept. 9. 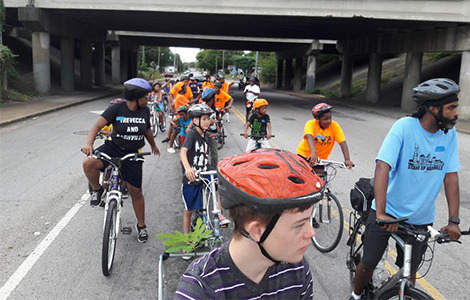 They’ll also participate in Walk/Bike Nashville on Oct. 7 and Nashville Tree Foundation’s annual Releafing Day, a tree-planting event planned for Nov. 17. “That’s our plan right now, to participate in other organizations’ events, and we’ll plug in our own trainings, too,” Davis said. 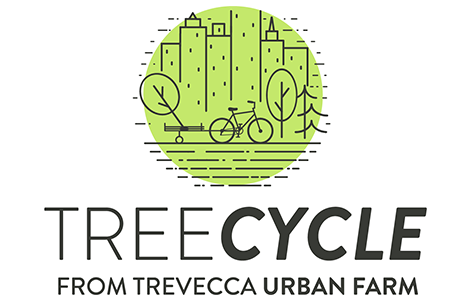 The main goal of the TreeCycle initiative, though, Davis said, is to fight back against food insecurity and economic factors that make it difficult for Trevecca’s neighbors to access healthy, nutritious foods. “The goal is to bring food justice to this community where there is not justice right now,” she said.